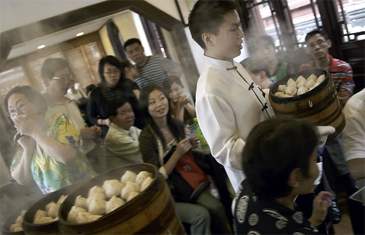 Nan Xiang is famous for its soup dumplings. Oct. 9, 2005 — Made for trade, the modern city of Shanghai came into being in the second half of the 19th century as a commercial link with the West. British, French, German and American traders settled there, eventually followed by White Russian refugees. They built a metropolis with Asia's first telephones, running water and electric power, a city of drugs, warlords, brothels and legendary riches. And like all expatriates everywhere, they brought their tastes in food with them. To this day, the Shanghainese have an appetite for croissants and French pastry and for Russian borscht (luo song tang, or Russian soup, on menus) although many may well not know their precise origins. After 1949, the old hedonistic culture was gradually submerged in Communist conformity, with gray tunics and shabby state shops supplanting the chic boutiques and throbbing dance halls that gave Shanghai its reputation as "the whore of the Orient." By all accounts, food, and especially restaurant food, took a back seat to ideology. "Ten years ago, a good restaurant was one that paid you," said Don St. Pierre Jr., managing partner of ASC, China's leading wine importer, with only modest hyperbole. "Now we're on the verge of being a world-class restaurant town." Richard Bisset, another old China hand, said that 17 years ago, when he came to Shanghai, "the Western food here ranged from Kobe beef to prawn thermidor. Full stop." Today, Shanghai is again one of the most galvanic cities anywhere, with foreigners once more pouring in to seek their fortunes and the port seemingly on its way to becoming the world's busiest. It makes an old-timer like me long to be young again and live there to share in its drama. For 13 straight years, it has maintained a double-digit growth rate, as the largely vacant landscape on the eastern side of the Huangpu River has been magically transformed into the steel-and-glass financial center called Pudong. With more than 2,000 flamboyant skyscrapers, Shanghai is now a vertical village rather than the low-lying city of the 1930's, much of it built by Jewish merchants of Iraqi or Syrian origin like the Sassoons and Kadoories. The only echo of the Sassoons today is a Vidal Sassoon (no kin) hairdressing salon. But the Kadoories, who control the Hong-Kong-based Peninsula chain, are building a luxurious hotel on the Bund, the boulevard along the river. The slightly pompous colonial buildings lining the Bund already house some of the toniest of the city's new generation of international restaurants, including the Michael Graves-designed Jean-Georges. Renowned chefs and obscure entrepreneurs from Britain, Singapore, Australia, the United States and elsewhere have flocked to Shanghai on the heels of the bankers and brokers, eager to serve you Italian, Japanese, Thai, German or Mexican food. Foods from afar compete with heaping helpings of first-rate Chinese dishes, from Guangzhou, Sichuan, Hunan and of course Shanghai. Local river prawns, slow-cooked pork rump, hairy crabs (in season) and above all xiao long bao, the soup dumplings beloved in the United States, are all on offer in classic form. 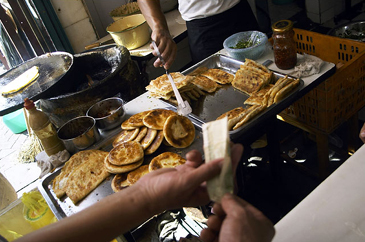 Fried bread, at a food stall on Changle Lu, is served for breakfast. The culinary renaissance is one reason, in fact, for Shanghai's re-emergence as a prime tourist destination, along with the city's refreshing green "lungs" - the many new parks and the thousands of plane trees in the former French Concession - its matchless new art museum, its Art Deco villas and office buildings, and the endless joie de vivre of its people. Gloomy, unsmiling and reluctant to make eye contact when my wife, Betsey, and I last visited the city a decade ago, they laugh and joke today, free at last to indulge in those old Shanghai pastimes, making money and spending it with abandon. On the second morning of our most recent stay in Shanghai, we ran into Jean-Georges Vongerichten and his right-hand man, Daniel Del Vecchio, at the Westin Hotel's startlingly polycultural breakfast buffet. That happy accident led to a sampling of Shanghainese food at its most down-to-earth at breakfast-time the next day. Near the corner of Changle Lu and Xiang Yang Bei Lu, not far from the museum, where banners were incongruously heralding an exhibition about Versailles and Louis XIV, we each polished off a half-dozen steamed, pork-filled soup dumplings, the size of a silver dollar, with perilously fragile skins, without spilling too much of the scalding liquid on our shirts. Unlike most of the other stalls, the place where we ate these actually had a few tables and stools, and even a sign outside. Its name: Maxim's. Thicker-skinned dumplings, sheng jian bao, fried cheek-to-cheek in shallow iron pans and then steamed, were dusted with chives and black sesame seeds. We followed instructions to dip them in the exceptional black Zhenjiang vinegar. Eye-poppingly good they were, too, although Jereme (pronounced Jeremy) Leung, a member of our noshing group, speculated slyly that the frying oil had not been changed in years. There were crepes at other stalls - delicate cong you bing, or scallion pancakes, and ji dan bing, a kind of breakfast burrito. To make that, a short-order wizard spread batter on a drum-shaped grill with what looked like a painter's spatula, broke an egg on top, added a dab of fermented soybean sauce and threw in some chives, coriander and mustard-plant leaves. The whole process took just a minute. Then he slapped either a salty cruller called you tiao or a piece of crisply fried bean curd skin across the finished product and rolled it up like a scroll. Mr. Vongerichten, in seventh heaven, pronounced it "the best breakfast in the world." By that time, I felt fat as a Strasbourg goose, but my eating buddies insisted that we stop at a 24-hour noodle shop on Shandong Zhonglu, behind the Westin, to watch a particularly deft cook do his stuff. "No need to eat," said Mr. Leung, a Hong Kong-born Chinese. "Just watch." Sure. We watched, all right, as a huge ball of dough was kneaded and rolled and tossed and hacked into ragged little squares that reminded Mr. Vongerichten, an Alsatian, of spaetzle, and twisted and stretched and flipped and folded into long, supple noodles. But of course I had to sample a bowl of beef noodle soup, lightly curry-flavored, before we left, and of course that spoiled my lunch. Bao Luo, in the French Concession, is all you might expect a Chinese restaurant to be - big, raucous, smoke-filled, dingy despite the marble on the walls - and more. It's open until 6 in the morning, and it often features a parade of fashionistas in thigh-high white boots around midnight. Its menu provides a primer of home-style Shanghainese cooking, however bizarre the English translations (for example, "lima bean curd with crisp hell"). Cold dishes first - amazingly tender, custardlike tofu, a reproach to the flannel-like stuff often served outside China, topped with coriander and chili oil; ma lan tou, made from the crunchy stems of the boltonia flower (a member of the aster family that I grow, but don't eat, at my farm in Pennsylvania); "drunken" chicken, marinated in rice wine; and kaofu, bran cubes flavored by five-spice soy sauce. 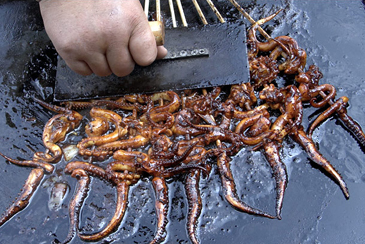 This is no cuisine for the squeamish. Warm plates filled the table as six of us struggled to keep up. Ti pang, the fabulously fatty Shanghainese pork shank, was luscious as foie gras. (One of our six, Tina Kanagaratnam, a Singapore-born food writer, told me, "Shanghai girls say that if you don't eat the fat you won't have good skin.") Crystal river prawns, bathed in egg whites before stir-frying, and yu xiang qiezi bao, spicy caramelized eggplant, were among my favorites. Patrick Cranley, Ms. Kanagaratnam's husband, a fluent Mandarin-speaker from Baltimore, noted that this was originally a Sichuan dish, long ago adopted by Shanghai as its own. "Something in the Shanghainese character," he said, "helps them to absorb, adapt and flourish." Having emerged intact from Shanghainese culinary primary school, we moved directly to postgraduate studies at an unprepossessing four-table hole in the wall called Chun, a block from the Jin Jiang Hotel, where Chou En-lai and Richard M. Nixon issued their momentous communiqu?in 1972. Susan Shirk, the State Department's top China expert in the Clinton administration, recommended it, and Dingli Shen, the Shanghai-born, Princeton-educated executive dean of the Institute of International Studies at Fudan University, joined us there. He had never been before, he said, but by the time we finished a lunchtime feast, which cost less than $8 a head, under the naked, unforgiving fluorescent bulbs, he assured us that he had never eaten better in his native city. That didn't surprise us a bit. Not after Lan-Lan, the round-faced, T-shirt-clad 47-year-old proprietor, who resisted all attempts to discover her formal name, had brought out her wares: among other treats, more heavenly tofu, served with salted duck egg yolk and clam strips; thin-shelled river shrimp, roe still attached, steamed with ginger; whole pomfret braised in soy (with plenty of Shanghai's beloved sugar added) and the pi?e de r?istance, giant snails whose meat had been removed, then chopped, mixed with pork and spices and reinserted into the shells. I don't know which was better, the fragrant juices we sucked out of the shells or the meat we pried out with toothpicks. "To be born in Shanghai is a great privilege," Dr. Shen mused. "You get better education, better economic opportunity, better health care, better everything than elsewhere in China." To which I added, "and some of the world's best food." Soup dumplings are the province of specialists armed with minuscule rolling pins. The most famous of all are made at the three-story Nan Xiang restaurant, adjacent to the ancient Yu Garden, whose teahouse served as the inspiration for millions of pieces of "willow pattern" china. All the world adores Nan Xiang, so reserve a day ahead, or resign yourself to a long wait. Try in any case to wangle a seat on the third floor, the only place where the most scrumptious dumplings are served - those whose filling includes crab roe as well as the usual crabmeat, pork and scallions. Two things set great dumplings apart from ordinary ones: the quality of the "soup," or broth, which at Nan Xiang has the mellow richness of the best veal stock, and the texture of the dumpling skins, which at Nan Xiang are translucently, meltingly thin. Wobbling winningly in their steamer, these tidbits are rivaled in Shanghai only by those at Din Tai Fung, a branch of a legendary Taipei dumpling house, which also has an outlet in Arcadia, Calif., near Los Angeles. In the rush to modernize, much of picturesque old Shanghai has been bulldozed, though not the junk shops of Fangbang Lu, where Betsey bought a crystal ball, perhaps in hopes of divining the future of this remarkable city, where communism and capitalism thrive alongside one another against all the odds. In Xintiandi, near there, renovated and reconstructed shikumen (stone-gated) houses have been grouped into a shopping, strolling and dining complex. Wildly popular with Chinese as well as with foreign visitors, it is Shanghai's first big stab at the adaptive reuse of old buildings. They sometimes call Shanghai Shang-buy, and in Xintiandi you can buy minimalist handbags and sleek silk pajamas with jade buttons at Annabel Lee, velvet blazers and feathered hats at Xavier, and modern design from Scandinavia, Thailand, Italy and even China at Simply Life. You can drink coffee, nibble glorious pastries and buy hand-made chocolates at Visage. You can have a drink at TMSK, sitting on crystal stools at a crystal bar, or at nearby Zin (short for Zinfandel), a nifty wine bar. Xin Ji Shi is the serious-chow champ of Xintiandi, whose name means "new heaven and earth." It may well serve the best hong shao rou, or red-cooked pork, in town, made from cubed pork belly bathed in a sauce made from star anise, sugar and Shanghai soy sauce, which is considered China's finest. The d?or may be upscale, nouvelle Shanghai, all burnished wood and smoky glass panels, but the cooking is traditional. Our meal at Xin Ji Shi was also memorable for a basket brimming with big, rosy prawns, roast chicken and dried chilies and for a bottle of 1993 Corton brought by Mr. St. Pierre, much less so for an eel dish totally overwhelmed by a sweet, sludgy sauce. Hong Kong, in the form of the handsome glass-and-granite Crystal Jade dim sum emporium, is just a few steps away from Xin Ji Shi. All the southern Chinese favorites - including char siu bao (barbecued pork buns), shrimp-filled har gow and egg tarts, among many others - are prepared to order and served at once, not rolled through the dining room on carts. But this is Shanghai, so there are also more northern delights like crispy won tons with hot chili sauce and, of course, soup dumplings. All are light and delicate, altogether first rate. You can eat modern Sichuan food at South Beauty's four locations and carefully made vegetarian dishes at Vegetarian Lifestyle's three. But if pressed for time, I would make a beeline for Guyi, which wins as many points for its chic d?or, featuring photos of the Shanghai that was, and its smiling (indeed giggling) service from young women as for its delicious Hunanese food. Not every dish is a flamethrower, which is as things should be. Among the high spots of a meal that balanced texture, color and intensity of flavor with unusual finesse: a great heap of green beans flavored by smoky Hunan ham; a short-rib hot pot with ginger, garlic and chilies; and fried prawns on a skewer. Unless you like to drink at altitude or crave a steak (in which case head for the upper floors of the Grand Hyatt Hotel, housed in the 54th to 87th floors of the Jinmao Tower building), there's no real need to visit Pudong. Stay on the western side of the river and do your gawking and talking there. 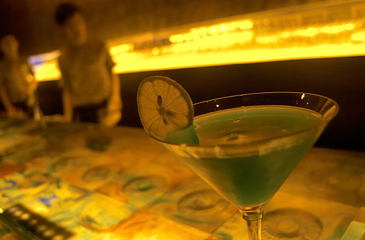 For location, location, etc., you can't match Michelle Garnaut's groundbreaking M on the Bund, opened in 1999. With a heart-stopping view of Pudong's sci-fi skyline right there in front of you, as bold as a billboard, and the Bund's brightly illuminated buildings curving away to your left and right, M's seventh-floor terrace is as fine a perch as Shanghai affords. On balmy nights, moneyed visitors and local movers and shakers still throng it, with their champagne flutes or superbly made dry martinis in hand. Ms. Garnaut, an Australian long resident in China, serves mostly old-fashioned European food, some of it made from prime local ingredients - opulent Chinese foie gras; crisp-skinned roast suckling pig; and (during their brief season) sensationally sweet peaches from Nanhui, like the ones often depicted on famille-rose porcelain. "We're proud not to be on the cutting edge," she told me. Fair enough. But the jelly with the foie gras was much too sweet for us, the salt-baked lamb was too salty, and the kitchen seemed to lack the consistency that characterizes some competitors, notably the big, buzzy restaurants at Three on the Bund, a converted bank building. The dining room of one of them, Laris, is drenched in white - white marble, white tablecloths, white orchids. "The food and clients provide the color here," said the man at its helm, David Laris, formerly chef at Mezzo in London. As befits someone of Greek ancestry, he serves great fish, including raw oysters from three continents, scallops with basil and Kalamata olives, and a fabulously earthy cauliflower and caviar soup, not unlike the brew served by Jean Joho in Chicago. For those who require turf with their surf, there's also a delicious cross-cultural pairing of five-spiced venison with Vietnamese banana leaf salad. And for the sweet of tooth, Mr. Laris makes a remarkable panna cotta flavored with pandanus leaves, which lend a subtle, vanilla-like taste. Jean-Georges gave us a nearly flawless meal. After a single Kumamoto oyster with a coronet of Champagne jelly and raw tuna with a dab of mayonnaise made with Thai chili paste, the chef de cuisine, Eric Johnson, sent out an exquisite dish of cubed raw kingfish with Taiwanese mangoes (imported under a new trade agreement) and a chili-lemon granita. Peppery, sweet and acidic, yellow, orange and red, in one bite. Dish after dish of similar excellence followed, as lunch stretched toward the cocktail hour while boats of every kind chugged along the river outside the restaurant's windows - more foie gras, with star anise flowers; peaches and endive hearts with pistachios and goat cheese dressing; crab dumplings with black pepper oil and tiny local peas; sweet scallops from Dalian, a port in north China, seared and paired with clams in a tomato jus; stunningly fresh steamed snapper on a basil purée, topped with cucumber strips for crunch; and Jason Casey's irresistible desserts, which coaxed every nuance of flavor from lush tropical fruits. The service in the elegant copper-and-blue dining room was silent and skillful, which is more than one can say about the Whampoa Club, in the same building, where the gifted 34-year-old Mr. Leung presides. His Normandie-like setting, with shantung silk, ostrich skin and hammered metal panels, is elegant enough. But the reception was disorganized, the waitresses' heels clattered intrusively on bare floors, and language skills were so rudimentary that we were utterly bewildered until a supervisor came to our assistance. This is perfectly acceptable at $10 a head, but not at $100. Mr. Leung's modern take on Chinese regional food is delightful. His caramelized minisquid reminded me why I was once addicted to Cracker Jacks. His "lion's head" pork meatballs came in a sumptuous winter-melon broth, with enoki mushrooms impishly used as "eyes." His king prawns dazzled in a mild wasabi sauce. His crisp, spicy eel strips and smoked fish showed the potential of river fish, treasured in Shanghai. 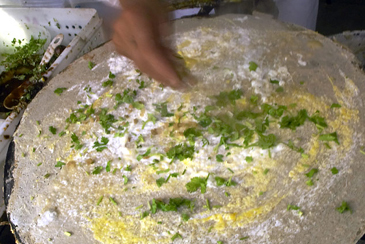 "We begin with traditional peasant-style recipes and try to update and refine them," he said. "Take the smoked fish. Usually, it's fried in the morning and left to cool all day. It often tastes stale, even rancid. We fry it to order and serve it warm, not at room temperature. 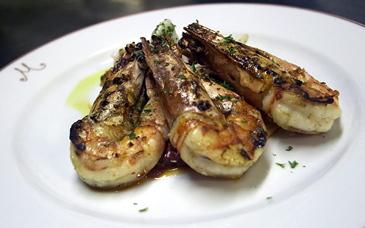 But the prawns - those, I must confess, are pure Jereme." King prawns at Michelle Garnaut's M on the Bund. The telephone country code for China is 86, and the city code for Shanghai is 21. Bao Lu, 2721 Fumin Lu; telephone 6279-2827. As many as 300 people are sometimes jammed into this atmospheric spot early in the evening, but go later and the crush isn't as bad. Classic Shanghainese food, less than $15 a head with beer. Chun, 124 Jinxian Lu; 6256-0301. Have your hotel concierge reserve well ahead for this tiny place, and take a Mandarin-speaking friend or guide if you want to understand what you're being offered. Cheap (under $10) and authentic. Xin Ji Shi, North Block Xintiandi, Building 9, Number 2, Lane 181; 6336-4746. The setting is sleek, the service is charming, and for the most part the food is very good. Try the noodles flavored with scallions. With wine, about $25. Nan Xiang, 85 Yuyuan Lu; 6355-4206. Soup-dumpling heaven in the oldest part of the city. All the xiao long bao you can eat for $20. Din Tai Fung, 12-20 Shuicheng Lu; 6208-4188. It's just a branch of a Taiwanese dumpling house, but who cares? The dumplings and other dishes are first-rate, and the open kitchen puts on quite a show. About $15, $25 with wine. Crystal Jade, South Block Xintiandi, House 6-7, Lane 123; 6385-8752. Stylish digs and carefully prepared dim sum (including some Shanghai and Beijing items as well as Hong Kong classics) account for long lines. Typically about $20. Guyi Hunan, 89 Fumin Lu; 6249-5628. There's a string of red peppers made of satin near the door - a warning that the food is spicy, but also a signal of the stylishness of this place. Good value: $12. M on the Bund, 5 Zhongshan Dong Yi Lu; 6350-9988. Great views, excellent wines and competent (if inconsistent) Continental cooking that sometimes ranges into exotica like Persian salads. Eat on the terrace if it's warm. $50. Laris, 3 Zhongshan Dong Yi Lu; 6321-9922. One of Shanghai's few raw bars, with great oysters and clams to begin, and some of the city's most imaginative house-made chocolates to end. This stuff does not come cheap. About $60. Jean-Georges, 3 Zhongshan Dong Yi Lu, 6321-7733. China's best Western-style restaurant, and every bit as successful as the Vongerichten palaces back home in New York. Cheaper, too, at $65. Polished service, gorgeous room. Whampoa Club, 3 Zhongshan Dong Yi Lu; 6321-3737. Jereme Leung takes Chinese food out of tourist class and puts it in first, where it belongs. In season, he works magic with the famous Shanghai hairy crabs. $60. R. W. Apple Jr. is serving as an associate editor of The New York Times.